But Thursday’s front-office shakeup is not really about Mills or Grunwald, the Knicks’ recent past or the season that will soon be underway. This is about Carmelo Anthony, next summer and the summer after that. Anthony can opt out of his contract in July, and the franchise is rightfully fearful that—despite his public statements to the contrary—he might walk away. The Knicks are carrying an expensive, capped-out roster, peppered with misfits and fragile veterans. Their window to contend in the Eastern Conference might already be closing. It would slam shut if Anthony flees next summer. As one rival team executive said of Thursday’s moves: “It was all to keep Carmelo.” The same executive said he believed that, if the decision had to be made now, Anthony would leave. Edited by magicbalala245, April 14, 2014 - 01:33 AM. Like it sums up, if he had to make the call now, he would definitely leave. But still have to wait an entire season of possible events. I just don't see what NYK can do to improve their roster, they are so limimted. Although likewise, if they were to just add one or two quality players by a miracle chance, he would probably be persuaded to stay, so it can go either way. I believe he would rather stay and in NY than come to LAL. Melo, on Grunwald's ouster: "I was shocked. I never heard about it and nobody knew it was coming." Was playing pickup game when he was told. Edited by magicbalala245, September 27, 2013 - 01:20 PM. Knicks' FO setting up Melo for the eventual fallout? 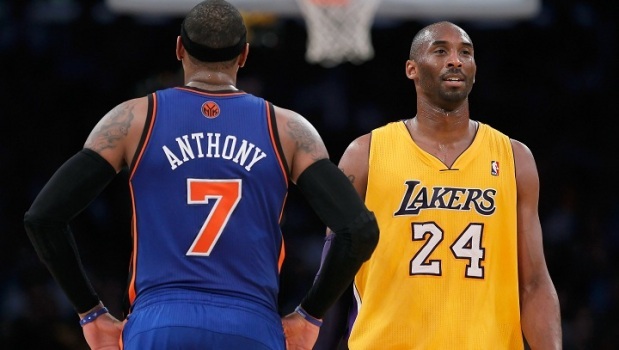 Works to Laker advantage if the media puts blame on Melo as far as GM replacement. is Melo really the answer though? All I know is with Cousins and Paul George signing an extentions, our 14/15 list keeps getting shorter. I sure hope we've got a Great Plan "B"
Wouldn't mind Melo at all! If Melo comes, chances at Lebron become exponentially high. Took 10 seconds to find. "The Knicks are carrying an expensive, capped-out roster, peppered with misfits and fragile veterans"
He will be on the wrong side of 30 for a max contract. Pass. Pretty much this. Sure he will make us a playoff team but we won't see a Finals if he's our best player. Mitch like he said it's not just the 2014 off-season it,s the 2015 one as well. I think Mitch's plan is to sign Melo in 2014 and Rondo in 2015 and have that lineup for Kobe's likely final year. Those three would give us a pretty good shot I think. Just Melo in 2014.. I mean.. put Melo on our current team. Is that team a contender? Yes it is. I think Mitch has that in mind for 2014 and in 2015 he wants to try to land Rondo. Of course he has to hope that the Celtics don't land Wiggins for that to happen but I think the 2014 plan is pretty much Melo and re-signing the guys that pan out this year.